The Twenty-Second Judicial District Commission on Judicial Performance unanimously (6-0) recommends that Judge JenniLynn Everette Lawrence BE RETAINED. After graduating from Mancos High School, Judge Lawrence obtained her BA in English from Fort Lewis College, followed by an MA in Interdisciplinary Education from Adams State College, and then her JD from the University of Wisconsin Law School. During her 13 years of private practice, she earned the esteemed AV Preeminent rating from Martindale Hubbell; Judge Lawrence was appointed to the County Court bench for the 22nd Judicial District on November 10th, 2010. Actively involved in the community, Judge Lawrence serves as a 4-H leader and advisor, is involved in the Sleeping Ute Chapter of the Daughters of the American Revolution, and is an active member of the Episcopal Church. Survey results have shown that since taking the bench, Judge Lawrence has shown improvement with both attorneys and non-attorneys: In 2012, Judge Lawrence received an overall grade of 3.09 with non-attorneys at 3.41 and attorneys at 2.77; in 2013, she received an overall grade of 3.27 with non-attorneys at 3.46 and attorneys at 3.08. Of all attorneys surveyed, 76% recommended to retain, 21% recommended to not retain, and 3% made no recommendation; of all non-attorneys surveyed, 81% recommended to retain, 11% to not retain, and 8% made no recommendation. Prior to making its recommendation, the Commission reviewed the results of 39 attorney and 180 non-attorney surveys; conducted unannounced courtroom observations; reviewed caseload statistics; received testimony from both the Public Defender and the 22nd Judicial District District Attorney; and conducted an interview with Judge Lawrence. Since her appointment, Judge Lawrence completed 191 CLE credit hours, including an intensive learning course through the National Judicial College for rural court judges. She leads a DUI specialty court and is a regular “Our Courts” presenter. Judge Lawrence is currently serving as the Four Corners Bar Association President and also serves on the trial judge’s counsel for the Colorado County Court Judges Association. She authored the chapter for the Colorado DUI Bench Book on sentencing and has participated in webinars on evidentiary issues in DUI cases. 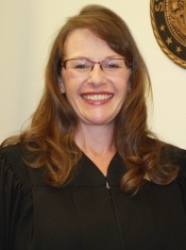 Since taking the bench, Judge Lawrence implemented changes in DUI Court procedures to ensure improved results; implemented a fair process procedure for modifying protection orders; performed independent research through the Arnold Foundation to analyze risk assessment for modifying pre-trial services; and increased the amount of time the Public Defenders spend in her courtroom. Judge Lawrence possesses a thorough understanding of the law, she issues clear and understandable decisions, she clearly explains all of her oral decisions to attorneys and non-attorneys alike, is very well organized, and has effectively improved the management of her docket.